France's rail network has been severely disrupted, as a wave of strikes against President Emmanuel Macron's labour reforms gets under way. Owojela’s Blog learnt that the start of the strike has been dubbed "Black Tuesday", but the action will spread over three months, affecting two days in every five. Staff at state railway SNCF are leading the strike, but the energy and waste collection sectors are also affected. The unrest presents Mr Macron's biggest challenge since his election last May. With the four main rail unions observing the strike, services have been severely curtailed. Some 77% of SNCF drivers were believed to be on strike. The company said 34% of its staff overall were striking. Only one in eight high-speed TGVs are scheduled and only one in five regional trains. Commuter lines into Paris have also been slashed and bus services have been hugely overcrowded. Some stations were crammed for the few trains available, others were deserted. The website that measures car traffic around the capital recorded about 420km (260 miles) of jams at rush hour. International services are more sketchily affected. Eurostar has 75% of trains running and the Thalys services to Belgium, the Netherlands and Germany are almost normal, but there are no services to Spain, Switzerland or Italy. Employees of Air France, who are demanding a 6% pay rise, are into the fourth day of industrial action. The airline is operating 75% of its flights. Unions have also called out all rubbish collectors, to push for the creation of a national collection service and better retirement options. Workers blockaded some waste treatment plants. Energy sector unions have also called strikes to demand, among other things, an end to the liberalisation of the energy markets and a review of deregulation. Thousands of students are also reportedly taking part in the strikes, in opposition to the toughening up of university entry regulations. There are three reasons why President Macron feels relatively optimistic about the rail strike. First, unlike in the last massive (and successful) general strike in 1995, this time there can have been no mistaking the government's intention to reform. Neither the public nor SNCF staff can pretend the planned changes come out of the blue. They are clearly part of the broad reform agenda for which Mr Macron was elected. Second, there is far less automatic sympathy for the SNCF than there used to be. The level of rail services has declined sharply, especially for commuters, who are as a result more open to calls for reform. Third, new options have opened up for commuters. There is home-working; car-pooling; expanded coach services. This should make it easier for workers to get round the inconvenience. All that said, these will be tense weeks for the government. Nerves are going to fray. People will get angry. Daily life will not be easy. In these circumstances, plans can go badly awry. A wrong move and public opinion could easily shift back behind the strikers. SNCF workers enjoy generous conditions, including automatic annual pay rises, early retirement, 28 days of paid annual leave and protection from dismissal. Their close relatives are also entitled to free rail tickets. But the rail unions feel the action is wider than that, and it will be a major test of union clout. Just over 11% of the French workforce is unionised - one of the lowest levels in the EU - but the unions traditionally punch above their weight, economically and politically. "We're defending the French public service, not just rail workers," said Emmanuel Grondein, head of union Sud Rail. The Macron government wants to phase out the special SNCF contracts, proposing to put new hires on contracts like those that apply elsewhere in industry. The aim is to open up the state railways to competition from 2023, in line with EU requirements. SNCF has €46.6bn ($57.5bn; £40bn) of debt. Mr Macron's Republic On The Move party also feels the strike has wider connotations. "We need to rid this country of its strike culture," spokesman Gabriel Attal said. Opposition to Mr Macron's agenda was shown on 22 March, when tens of thousands of teachers, nurses and other workers joined rail staff on strike. 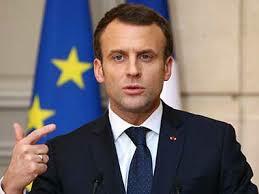 There has being speculations that in Paris many union members see Mr Macron as the man who wants to break the power of the unions. But strikes in September failed to stop Mr Macron passing laws that make it easier for firms to hire and fire, and the majority of the public are opposed to industrial action this time.